Rising levels of global rainfall will be a key channel through which farmers in developing countries are exposed to climate change. As this column explains, it is essential for policy-makers to recognize the potential risks to farmers’ incomes from such changing weather patterns. These research findings have important implications for how we measure the impact of environmental shocks on agriculture. Climate change is expected to lead to an 8% increase in global rainfall by the second half of the twenty-first century. Such changes in rainfall patterns are likely to have especially important effects in developing countries, where rain-fed agriculture is more prevalent, and the resources needed for farmers to adapt are limited. In India, for example, which is the country that we have been studying, 52% of agricultural land is rain-fed and not irrigated. Thus, the effects of changes in rainfall patterns constitute a key channel through which farmers in developing countries are exposed to climate change. This raises the immediate policy challenge of designing adequate safety nets for farmers who depend on rainfall. To date, most policies designed to protect farmers from rainfall shocks have concentrated on droughts. For example, almost all discussions on the need for climate-smart agricultural methods to address rainfall anomalies focus on developing greater drought resistance. 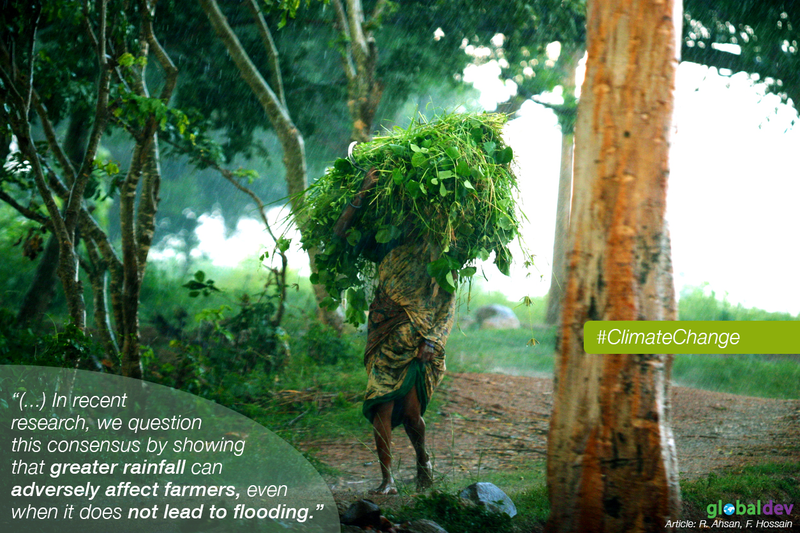 Implicit in these discussions is the consensus that greater rainfall is unlikely to have adverse effects on farmers. This consensus is based on academic work that emphasizes the adverse effects of droughts, and which concludes that greater rainfall either has a positive or benign effect on agricultural production and income. In recent research, we question this consensus by showing that greater rainfall can adversely affect farmers, even when it does not lead to flooding. Central to our new findings is the idea that patches of high or low rainfall are rarely restricted to individual districts and instead span multiple districts. For example, Figure 1 illustrates monsoon rainfall patterns in India in 2011. Notice that patches of high rainfall spanned multiple districts in central and western India, while patches of low rainfall spanned multiple districts in northeastern and southern India. The fact that rainfall patterns span multiple districts raises the possibility that crop prices and farm incomes in a district will be affected by rainfall in nearby districts. In other words, rainfall may have what economists call ‘spatial spillover effects’. Why might these spillover effects matter? Consider a farmer in a district in India. Greater rainfall in that district will increase this farmer's crop output, and for a given crop price, increase their income. But if one district experiences greater rainfall, then so will other neighboring districts. This means that when an individual farmer’s production increases due to rain, so will the production of all other nearby farmers who are growing the same crop. This increase in regional crop output will lower crop prices. Our empirical analysis using household-level data from India provides evidence of such an adverse spatial spillover effect on crop prices. From the farmer’s perspective, the fall in crop prices can either be a blessing or a curse. The outcome will depend on the responsiveness of demand for the crop to change in prices—what economists call its ‘price elasticity’. If demand for the crop is ‘price inelastic’, then a price decline will lead to a less than proportionate increase in crop sales and thereby reduce a farmer’s income. Most estimates suggest that food tends to have inelastic demand, which suggests that the income-reducing scenario is likely. Indeed, our analysis confirms that this is the case. To get a sense of the size of this adverse effect, consider a district where monsoon rainfall in neighboring areas is 100 millimeters greater than the historical average. Our analysis suggests that rural households in such locations experience a 3.74% reduction in total consumption because of the spatial spillover effect. This economically significant result has two important implications. First, it suggests that the sanguine view that greater rainfall has either positive or benign effects on farmers is something that policy-makers ought to reconsider. Farmers who face moderate-to-low rainfall in their own district and high rainfall in neighboring districts may in fact be worse off due to greater rain. Second, our results have important implications for how we measure the impact of other weather and environmental shocks on agriculture. Regardless of whether we analyze the effects of weather shocks (such as temperature) or environmental shocks (such as groundwater depletion), it is likely that the shocks encompass broad regions. As a result, they are likely to have spatial spillover effects with important implications for the wellbeing of households across developing countries. Reshad N Ahsan is a Senior Lecturer in the Department of Economics at the University of Melbourne. Reshad’s research interests are at the intersection of International Trade and Development Economics. Farzana Hossain is a Ph.D. candidate in Economics at the University of Melbourne. Her current research focuses on the effects of extreme weather events on households and firms in developing countries.